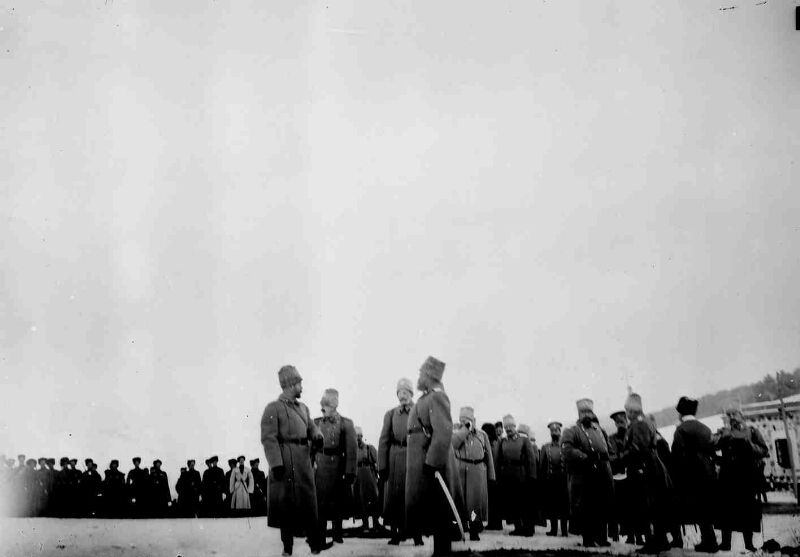 Nicholas II and the command of the Caucasian Front in Sarykamysh after taking it by Russian troops [Izomaterial]: [photo]. - [from. Mengzhenert], December 1, 1914. - Contact seal from a glass photographic plate, black and white; 18x24 cm. - In the retinue of Nicholas II: PK Benckendorff, VN Orlov, AA Drenteni (far right) . 1. Nicholas II (Emperor of Russia, 1868 - 1918) - Travels - 1914 - 1917 - Photographs. 2. Orlov, Vladimir Nikolaevich (1868 - 1927) - Photographs. 3. Benckendorff, Pavel Konstantinovich (1853 - 1921) - Photographs. 4. The Caucasian Front (1914 - 1917) - Photographs. 5. Power (collection). 6. The First World War - Russia - 1914 - 1918 - Photographs. 7. Sarykamysh, city (Turkey) - History - early 20th century. -- Photo. 8. Documentary photographs.